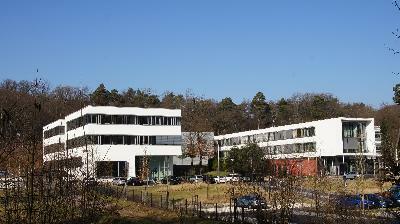 KIST Europe is located on the Saarbrücken Campus of Saarland University. TSE has laboratories and offices in Bldg. E7 2 of KIST Europe (left building on the photograph above). The two chemical laboratories are very well equipped with fume hoods and gas supply (H2, N2, O2, SA, He, CO2). The scientific apparatus comprises two fuel cell test stations, a number of potentiostats (partly with EIS) incl. a multi-potentiostat, a rotating disc electrode, etc., and a glove box. TSE has access to seminar rooms and the infrastructure of KIST Europe as well as to the university infrastructure.